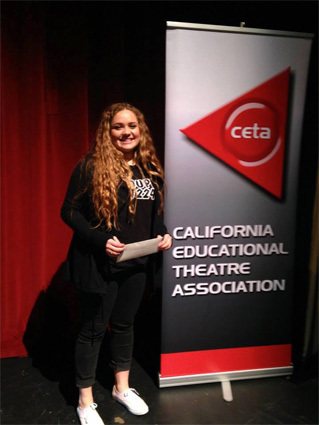 The grant is given to a high school senior from southern California who plans to major or minor in theatre in their post-secondary education with the goal of becoming a theatre educator. Award committee will consist of three members who are either a high school theatre teachers or college/university theatre teachers. Applicants will be narrowed by the committee to ten finalists by January 1st. These ten finalists will be notified by letter and must attend the CETA Southern High School Theatre Festival to be interviewed by the committee on the Saturday of the festival. The Scholarship Award will be presented at the Awards Ceremony on Sunday of the festival. Recipient must send proof of registration and declared major or minor in Theatre, in the student’s name, by October 15th of their freshman year in college. Funds will be sent then be sent to the recipient by the CETA Treasurer.